Well, things have picked up, in terms of both true quality and in the arguments over how true that quality is. This morning it felt nearly unanimous that we'd just left Xavier Beauvois's "Of Men and Gods" having watched the winner of the Palme d 'Or. It's either too unlikely or too obvious to be true, and yet: Eight Trappist monks on a hilltop monastery overlooking an impoverished Algerian mountain village, during the country's civil war, debate whether to return to France after the local mujahideen make life dangerous both for them and the Arabs whose lives they improve with kindness and medical care. Going in I feared guilty corniness. But the film doesn't take its title lightly. Beauvois, a directing actor who's remained under the radar, individuates each of the monks, while not completely demonizing the terrorists, who, ironically enough, want medical care, too. I watched six old men and two middle-aged ones think morally, philosophically, theologically, and personally about whether to let the terrorists win, and I found myself vacillating. "Don't be a wimp!" "Are you crazy? Go." "What would Jesus do?" Needless to say, the right thing is done (the movie is based actual events) but not without a theater full of hundreds of people sobbing in the dark. The film doesn't change life or the movies. It's hardly the best thing I've seen this week. But Beauvois demonstrates a patience, restraint, and sense of higher purpose that emotionally elevates what could have been the sort of middlebrow heart-tugger that the French have been known to submit for foreign-language Oscar consideration. Le jurie de Tim Burton just might go for it. I spent the rest of the morning and the first half of the afternoon watching "The Autobiography of Nicolae Ceauşescu," an ingenious assembly of footage of official events from the Romanian dictator's years in office. It's so obvious yet such a brilliant idea, and Andrei Ujica pulls it off. The material speaks for itself, but Ujica provides a guiding editorial spirit. It's an oblique but telling a look into the man whose totalitarian government haunts this current class of Romanian filmmaking. As you watch the official Ceauşescu, who's saluted and paraded and "reelected" with gusto (nobody put on a pageant for him like the Chinese), you're forced to reconcile what sounds like boilerplate ideological speeches with the grisly reality of his regime, which was overthrown in 1989. It's a comedy with a tragic, outrageous subconscious. When I left three hours later, people were still sniping over "Biutiful," which is the sort of debate that has legs. So does the one that got underway last night about Abbas Kiorastami's "Certified Copy." Iran's most famous director would seem to be one of the world's least likely men to try conventional romantic comedy. But, boy, has he. It's the easily the most pleasurable movie I've seen this year. It's just this year's Cannes poster woman, Juliette Binoche, walking around a Tuscan village arguing with and emoting at the British author who's becomes her ambivalent accomplice in role-playing. William Shimell, the English opera singer, plays the man, and he's, as they say, a pompous twit. She finds him intriguing, which with his handsomely tired face, he is. In Italian, French, and English, they talk about art and marriage and parenting -- well, she talks, he rebuts -- and at some point, the two strangers wind up mistaken, in a terrific scene in a cafe, for an actual husband and wife, which she goes along with, then so does he. It's a misunderstanding that leaves the film cloaked in ambiguity. Are they feigning marriage or feigning feigning it? That uncertainty becomes pretentious. While being very Kiarostami, it feels like an attempt to add degree of lyricism that would distinguish it from Richard Linklater's "Before Sunrise" and "Before Sunset." But the film is romantic and, above all, funny. 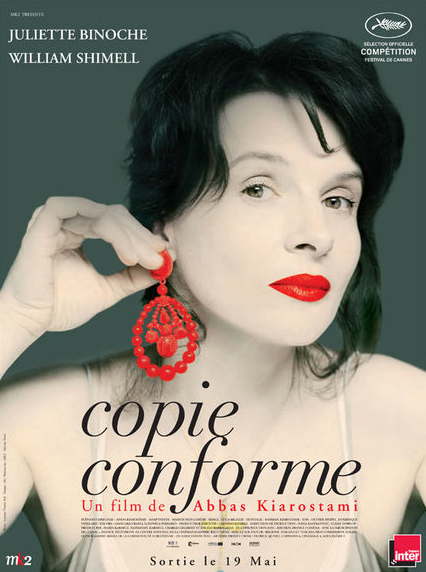 A lot of the credit goes to Binoche, who's full of little surprises. She makes being on camera seem like the easiest thing in the world, which is what great stars can do -- that and make you feel as alive as they appear to be. The way she throws away her lines and rolls her eyes and stares both at Shimell and, courtesy of Kiarostami's framing, at us. I would apologize to the man seated in the row in front of me for laughing as hard and as loud as I did during the film. But I think he kept turning around because whoever was sitting in front of him was kicking his chair. Plus, he booed at the end. Admittedly, this has been a bad year for jeer-worthiness, but "Certified Copy," even for people who yawned, is hardly worthy of contempt. In many ways, whether or not you believe in it, the movie fulfills a real desire to see two people talk about real human issues. But I understand the source of some of the aggravation. This is the first film Kiarostami's made outside of Iran, and, I think, given the political nature of his work (he won the Palme d'Or for "A Taste of Cherry," in 1997), there's the sense that this new movie, which is part of the main competition, is frivolous, that it's a Kiarostami movie for people who don't like Kiarostami. Either way, it's the first movie he's made where he appears to be enjoying himself, which sometimes a director, especially one as busy challenging his country's oppressive government as he is, needs to do as much as his audience does. Interestingly, at his press conference this afternoon, Kiarostami took a handful of questions about Iranian authorities and the imprisonment of his colleague and countryman Jafar Panahi, answering chiefly by pointing us to the open letter he wrote in March. He then requested that he be asked only about the new film. Nice try. The ongoing questions about Panahi and freedom of expression made the ever-empathetic Juliette Binoche sob, nce after a journalist herself began to weep while asking Kiarostami a question. With Panahi now on a hunger strike and offering instructions about what to do with his remains, a thick pall has now been cast over the moviegoing. Panahi remains our reality check.